I recently read two quotes by H.G. Wells, one written before World War II, and the other after. H.G. Wells must have had his head stuck in the sand in 1937 in order to think that the world was on the verge of utopia. Hitler had a firm grip on Germany and clearly had an expansionist agenda, Stalin was up to his knees in blood, and war was raging between Japan and China. The Second World War was especially crushing to the hopes of those who held to an optimistic view of the future of humanity. Those who believe that humans are on a path to something approaching a utopia keep on running into a wall. There is something fundamentally flawed about humanity. To say otherwise is, like Wells in 1937, to bury one’s head in the sand. We Christians call this fundamental flaw sin, which is rebellion against God. The failure to recognize the human sin problem is a reason why utopian systems, such as communism, turn out to be such bitter disappointments. What areas do we (as Christians, as a society) have our heads buried in the sand? In hind sight, it is easy to list a dozen reasons why Wells should not have been so optimistic in 1937. Are there some big, flashing, DANGER signs that ought to be obvious to us? How do we best communicate the dire straits we are in to those who are overly optimistic, and the hope that we have in Christ to those who are driven to despair by the world? From the ESRI Map Book Online volume 25: What if all the polar ice melted? 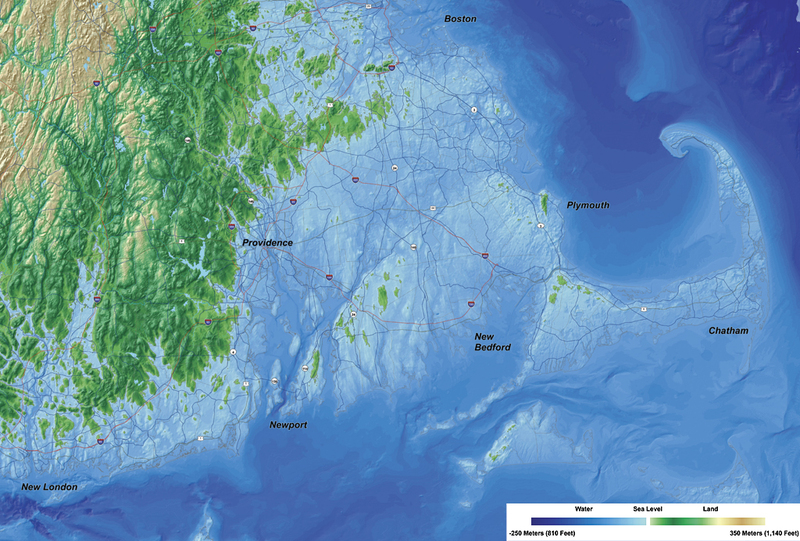 This map is a depiction of Rhode Island and southeastern Massachusetts/Cape Cod inundated by a 67-meter (73-yard) sea level rise resulting from a total melting of the polar ice caps. Although an unlikely scenario, the map was created as an attention grabber for display at the University of Rhode Island 2008 Honors Colloquium Lecture Series on Global Warming. A good map can be artistic as well as informative; in fact the two often go together. The annual ESRI map books are available online or in book form (I am happy to own a couple editions). One of the most significant influences that directed me into missionary service (my family served with ReachGlobal—the international mission of the Evangelical Free Church of America—from 2002 to 2008) was when we purchased a copy of Operation World back in the early days of our marriage. 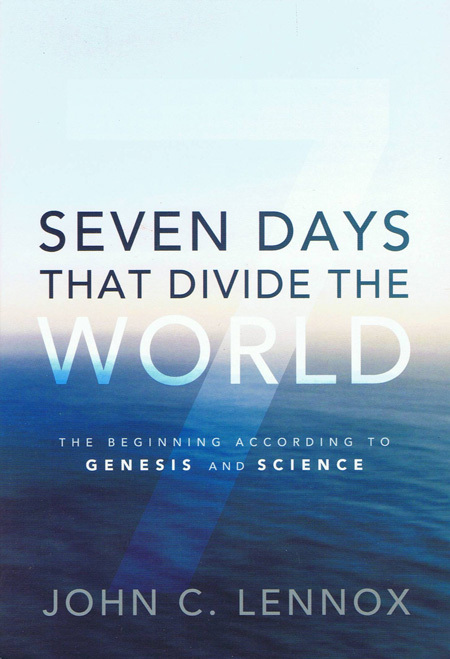 This book is a day-by-day prayer guide to the nations. For example, April 4 is Chile, and June 19-July 4 is India. 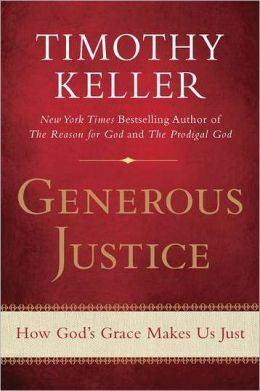 This book helped open our eyes to both the needs and opportunities to advance the Kingdom of God through evangelism and related ministries around the globe. The 7th edition of Operation World came out just a few months ago, and God is using it to get me thinking more about missions. And many other answers to prayer: the growth of non-western missions, cooperation between missionaries from different countries and denominations, Bible translation (95% of the world has access to the Bible in a language they know). Increased levels of consumption, especially when adopted by the billions of people in Asia, may push the already-stretched resources of the world over the brink. The world must be weaned off its reliance upon fossil fuels and extraction economies (mining, logging, fishing, others), and more sustainable alternatives must be developed, especially as massive new economies in the Majority World push hard to catch up to the West. Threats to human health, including disease. HIV/AIDS has been the high profile disease of the past 20 years, but treatments, increasing awareness and changing behaviour patterns see infection rates declining. Cancer continues to take many lives all over the world. New, resistant strains of old diseases, such as malaria and tuberculosis, are spreading. HIV, SARS and H5N1 are examples of recent pandemics; fears abound of new ones, more virulent and deadly. Less glamorously, diseases associated with malnutrition, poverty, unclean water supplies and lack of sanitation are even greater threats to children—pneumonia, diarrhoea, TB and others. Included in this is malaria, which kills as many people globally as AIDS and has a similarly devastating effect on economies. Air and water pollution probably contribute to as many deaths annually as all of these diseases combined. Energy research is possibly the highest profile and most globally important area needing technological progress. Fossil fuels are highly polluting, nuclear power dangerous and alternative energies—such as bio-fuels, solar, wind and wave—are as yet inefficient and inadequate. More than ever before, finding efficient, safe, non-polluting, renewable energy sources is attracting greater research and investment. A breakthrough in energy technology would transform the world’s economy and ecology. Water will be among the world’s most crucial issues in the future. Given that sufficient fresh water exists globally to sustain humanity (even if the locations of water sources and human population do not match up well), the salient issues on a global level are more about ethics, equity, distribution and consumption. a) Access to clean water. Already, around one in six people lacks access to safe drinking water; by 2025, it is estimated that three billion will lack access to fresh water. Additionally, nearly one in three lacks access to adequate sanitation, and this in turn contributes greatly to disease, malnutrition and mortality, especially among children. b) Current wastefulness. The developed world uses more than 30 times more water per person than the developing world. And the vast bulk of water waste is through inefficient agricultural systems, which account for 70% of humanity’s use of fresh water. Even diets (such as high consumption of red meat) that require much more water are a source of inequitable water use; the aspirations of most of the world to Western lifestyles, consumption levels and industrial output will generate even more waste and place even greater stresses on water supplies. c) Future societal and demographic changes. The large majority of future population growth will be in areas where safe water is in short supply. This, combined with ever greater industrialization (greater demands for water) and urbanization (population moving further from clean water sources), means that demands on water supplies will be even more intense in the future. i. The Amu Darya/Oxus of Central Asia. ii. The Tigris-Euphrates (Turkey, Syria, Iraq, Iran). iii. The Jordan (Israel, Syria, Jordan). iv. The Nile (Egypt, Sudan, Ethiopia). v. The nations to the north and south of the Sahara Desert. Demands for other natural resources, when combined with population growth and increasing levels of consumption, are at the core of what will make or break human civilization’s progress in the 21st century. a) Energy consumption is still vastly dominated by non-renewable resources such as fossil fuels. Until greener and more renewable sources can be developed to a level that makes them feasible alternatives, nuclear power might be the only other alternative. b) Food production is another area where great changes are afoot. Genetically modified crops, the environmental impact of current agricultural systems and current trends in global dietary patterns all raise serious economic, environmental and ethical questions—from organic foods to raising cattle to fishing. The existence of food is not a problem for the world’s masses; at the heart of most problems are the amount of waste and the cost and difficulty of production and distribution. Growing crops for fuel, rather than food, intensifies these troubles. c) Other natural resources are also being rapidly depleted. Some resources, such as old-growth hardwood trees, can be renewed, though not nearly at the speed demanded by consumption. Others, such as minerals, are non-renewable, yet they are being extracted and used at increasing rates. Climate change is now generally accepted as having a human causal component. Population growth, rapid industrialization and increasing consumption have an undeniable environmental/ecological impact. The negative implications of possible global warming are: desertification, soil exhaustion, greater frequency of natural disasters such as flooding and drought, water table salinization, flooding in low-lying coastal systems, massive loss of habitat for millions of species and unprecedented human migration. The staggering scale of waste and pollution—from plastics to pesticides to hormones and more—affects our water systems, our climate and even our biology. Despite the fact that humans still know little about these complex dynamics, green ethics have almost become a religion in themselves, the adherence to which is demanded in much of the developed world. 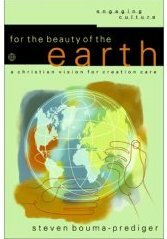 However, it has also fostered in the Church the rightful and necessary development of a theology of Creation stewardship and compelled Christians to reconsider how biblical our lifestyles are. Water, energy, food production, climate change. These are critical subjects that will effect the church and the entire world in the 21st century. Will Christians be right in the thick of research, action, and advocacy, or will we leave that to someone else (while billions suffer)? Operation World can be purchased from Amazon.com and many other places. Buy it and pray for the nations. CHERSKY, Russia – Wild horses have returned to northern Siberia. So have musk oxen, hairy beasts that once shared this icy land with woolly mammoths and saber-toothed cats. Moose and reindeer are here, and may one day be joined by Canadian bison and deer. Unlike “re-wilding” ideas in the United States (e.g. Montana), where most land is used for one thing or another, this one is along the Kolyma River (of gulag fame) in Siberia, which is about as isolated as one can get. Isn’t this a little taste of what nature was meant to be, with the earth, sky, and sea “swarming with swarms of living creatures?” (Gen 1:20,24). Two popular topics among Evangelical Christians for the past several decades have been origins—especially young-Earth creationism—and dispensational end-times eschatology (eschatology is the doctrine of the last things, including the return of Christ and the final judgment). Young-earth creationism has certainly been the prevailing dogma in Evangelical Christian education and in many churches and Christian colleges. Go to a Christian home school convention or book fair, and books presenting any kind of old-Earth perspective will be difficult or impossible to find. At the popular level, books on the end times, such as Hal Lindsey’s Late Great Planet Earth and Tim Lahaye’s Left Behind series, have been mega best sellers. 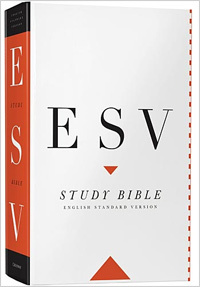 Many look at these two viewpoints as grounded in Scripture, and as firm evidence for the truthfulness of the Bible. Other Christians look at them as questionable, harmful, or at times downright goofy. The premise of Beyond Creation Science (subtitle: New Covenant Creation from Genesis to Revelation) by Timothy Martin and Jeffrey Vaughn is that Evangelical Christians are wrong about both ends of the Bible. 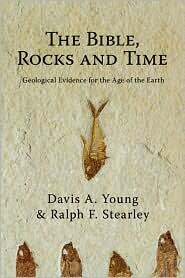 They do an excellent job of laying out a Biblical case against young-Earth creationism, with its 6000-year old Earth and global flood. 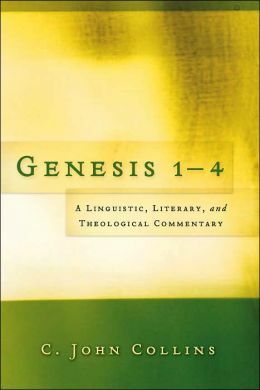 People who only read materials from the young-Earth organizations, such as Answers in Genesis and the Institute for Creation Research, are generally quite unaware that there is a vast amount of conservative, Evangelical Biblical scholarship that shows that the Bible requires neither a young-Earth nor a global flood, and Martin and Vaughn do a good job of presenting this case. I’ll give my thoughts on Martin and Vaughn’s full preterist eschatology in part 2 of this book review. I have many positive things to say about the authors’ Biblical analysis of young-Earth creationism. They point out that modern geology, with its view of billions of years of Earth history, was not devised as an attack on the Bible or Christianity. Few Christians voiced opposition to an ancient Earth while the concept was being developed in the 1700s and 1800s, and many of the most eminent geologists of that time were themselves Christians. For the sake of brevity, I won’t look at each of these, but will focus on the strong Biblical case they make for the flood being local, rather being global. If the subject of the account is planet Earth, then does this text [Gen 8:13-14] not teach that the oceans dried up at the end of the flood? Did the entire globe become dry? The plain statement of the text makes much more sense if it refers to a particular local place or “the land” where Noah lived. If the Genesis flood created the geologic column and radically reshaped the topography of the earth, why do we still have the same rivers in Mesopotamia that Genesis references? The Tigris and Euphrates have been known by those names since millennia before Christ. Would not a global flood, which lays down thousands of feet of strata around the world, obliterate those rivers we see referenced earlier in Genesis? Why would the ark land in the same part of the world after drifting on a worldwide ocean for many months? Noah appeared to find his world familiar after he landed. He certainly knew how to grow grapes after the flood. A local flood explains why the ark landed in the same part of the world Noah originally lived, i.e., somewhere in the Middle East. How could one flood event sort out unique fossils to specific layers of strata? A worldwide flood which created the fossil record all at once would leave a chaotic mix of fossils throughout the entire geological column. Outside of a few geological “hotspots,” geologists find specific fossils in each layer of strata. Would one chaotic flood event place fossils neatly in order? If the fossil record is a result of the flood, then it means that the number of animals alive in Noah’s day were vastly more than today. Noah was commanded to take a pair of every animal on board, which means a pair of all the animals documented in the fossil record (which are now extinct) on top of all the animals we are familiar with today! They would need food water for these as well, dinosaurs and all. This logically means that most of the species of animals that God originally created and Noah put on the ark went extinct after the flood. There is a tremendous amount of life documented in the fossil record which is not alive today. More than 95% of the animals that have lived on earth are now extinct. Why would God order Noah to preserve all the animals by bringing them on to the ark and then cause their extinction shortly after the flood? For example, did Noah take dinosaurs (whether eggs or mature) onto the ark only to have them all go extinct? If so, then the explicit reason given for the ark was almost a complete failure. Only a tiny percentage of the animals really survived. No wonder Noah took up drinking! This translation is every bit as legitimate as translating erets as “earth,” and presents the flood as a local, rather than global event. The authors focus on Biblical rather than scientific arguments for an old Earth and local flood, but when they discuss geological concepts they get their facts right, something that is not done even by some other advocates of an old Earth. I’m not as impressed by their eschatology, which I’ll take a look at in part 2. 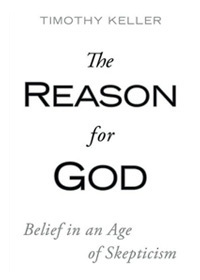 The book’s website is: Beyond Creation Science. One of the authors graciously sent me a copy of the book for review. P.S. Part two of my book review is a critique of the authors’ position on eschatology known as full preterism, which is a deviation from what the church has always taught regarding the return of Christ.